A bus industry event worthy of the NSW Premier’s attendance unfolded late last week with the announcement of 200 new State Transit Authority buses to be built at Custom in western Sydney. The NSW Government will replace 200 older vehicles in the State Transit fleet covering Sydney and Newcastle, with chassis supplied by Volvo and Scania. NSW Premier Kristina Keneally says the $88 million investment in new buses will deliver an extra 8,800 air-conditioned seats for Sydney and Newcastle commuters. She says 49 full time jobs, including six apprenticeships will be created from the bus building program. These new buses are over and above the 1000 growth buses the NSW Government will purchase over ten years under the Metropolitan Transport Plan. "We’ve already rolled out more than 100 growth buses in the past six months, boosting services in the Central Coast, the Hunter, and West and North Western Sydney," Keneally says. NSW Transport Minister John Robertson says the new buses will be built with the latest technology. "The 12.5 metre, air-conditioned, low-floor, rigid buses are the latest and most fuel efficient diesel bus models available, developed by Volvo and Scania," Robertson says. "These 200 new buses will mean that by 2013, more than 80 per cent of the State Transit bus fleet will be air-conditioned." 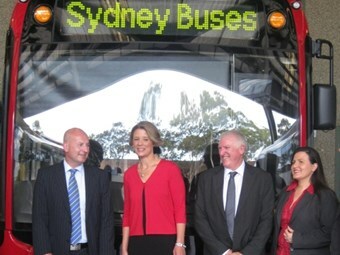 Up to 50 of the new buses will be allocated to Newcastle, with the remaining vehicles deployed in Sydney. "The first 100 of the new buses will be in operation by mid-2012, with the remaining 100 due by mid-2013." Volvo and Scania will provide 100 chassis each. Volvo Bus General Manager David Mead says it’s the seventh time since 2002 Volvo has successfully secured contracts put to tender by the STA. "The new contract will see buses built on the Volvo B7RLE chassis enter the STA fleet for the first time," Mead says. "We are particularly excited about this given the B7RLE model is now well proven in the Australian market and continues to set the industry standard for fuel efficiency, driveability and lifecycle costs." Scania Australia National Bus and Coach Manager Trevor O’Brien says Scania worked hard for several years to win new business from the STA. "Our branch in Sydney has been committed to showing STA we have the right facilities and the right personnel, expertise and back-up to ensure we can meet the rigorous demands of transport operators such as the STA," O’Brien says. "Scania NSW State Manager Kasey Chetty and his team have forged a good working relationship with STA, and this order reflects the faith they have in our ability to deliver the service and support they need, particularly in the after sales area." O’Brien says a dedicated team of Scania technicians has been formed to service the STA account. The Scanias to be supplied for the STA contract are two-door, two-axle K280UB4x2 specification vehicles with Euro 5 plus EEV emission compliance. The 280hp five-cylinder engine features Scania’s latest generation Extra High Pressure Fuel Injection as well as a variable geometry turbocharger to ensure emissions are as low as possible and power delivery as seamless as possible. The new, more powerful engines are mated to a six-speed ZF automatic gearbox. The Scania chassis will be fitted with the latest generation Custom-designed 44-seat CB80 body. Deliveries will commence in October 2011, and run through to the middle of 2013.